Earlier today Dragon's Eye Productions launched the first client update in over a year for their massively multiplayer online game Furcadia. The Kitterwing update provides a number of new features besides support for the Kitterwing avatar itself, including a new class of wings, a free bovine/minotaur avatar, and 24-bit non-remappable portraits. Prior versions used indexed colour which provided only a small number of switchable colour values per portrait. Full in-world 32-bit colour support is still "two updates away", according to producer Emerald Flame. The update was originally intended to contain an even larger number of features, but was rushed out to provide compatibility with Windows Vista, which places restrictions on where programs may write documents such as log files and user preferences. 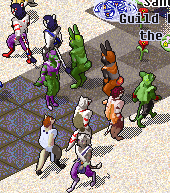 Furcadia is a popular free game, with over 60,000 regular players (users who log in once a month). Player-created areas known as dreams are numerous; many make heavy use of the game's scripting language, DragonSpeak. The game celebrated its tenth anniversary last December. Dragon's Eye makes money from selling add-ons, including avatar upgrades, sponsorships and gifts for other players. Yearly revenue was under $1 million in 2005.